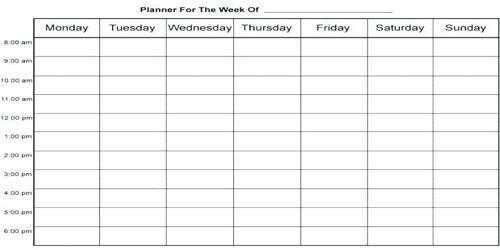 Never forget to mention the day, date and the time of every task on the homework agenda. Allow time for breaks, travel time, lunch, dinner, playtime, etc. in the agenda prepared. Adults need to take into account the time they spend at work as well as the time allotted for chores at home. Time should also be set aside to look into the activities of the children and ensure they have completed the tasks they were assigned. Monday — 4:30 PM — 5 PM — 5:30 PM — 6 PM — 6:30 PM — 7 PM — 7:30 PM — 8 PM — 8:30 PM — 9 PM — 9:30 PM. Tuesday — 4:30 PM — 5 PM — 5:30 PM — 6 PM — 6:30 PM — 7 PM — 7:30 PM — 8 PM — 8:30 PM — 9 PM — 9:30 PM. Wednesday — 4:30 PM — 5 PM — 5:30 PM — 6 PM — 6:30 PM — 7 PM — 7:30 PM — 8 PM — 8:30 PM — 9 PM — 9:30 PM. Thursday — 4:30 PM — 5 PM — 5:30 PM — 6 PM — 6:30 PM — 7 PM — 7:30 PM — 8 PM — 8:30 PM — 9 PM — 9:30 PM. Friday — 4:30 PM — 5 PM — 5:30 PM — 6 PM — 6:30 PM — 7 PM — 7:30 PM — 8 PM — 8:30 PM — 9 PM — 9:30 PM. Students must also consider any daily or weekly activities which they have been assigned with and make a note of them initially. Recommendations can be sought from their teachers in class or their parents for including other information which may be necessary. Saturday — 7 AM to 10 AM [Break Fast And Home Chores]. 10:30 AM To 12 PM [Groceries And Shopping for Household Goods] 1 PM Lunch. 2 PM Break. 3 PM Attending to Household Activities. 5 PM Preparing for the Weekend, Dinner And Entertainment For the Evening] 10:30 PM end Of the Day. Sunday — 8 AM [Breakfast And Preparing For A Weekend sojourn]. 7 PM [Return from The Weekend Trip And dinner]. 8 PM To 10:30 PM [Entertainment For the Evening And End of the Day].